Lots of people have been poring over this week’s report on self-employment from the ONS. 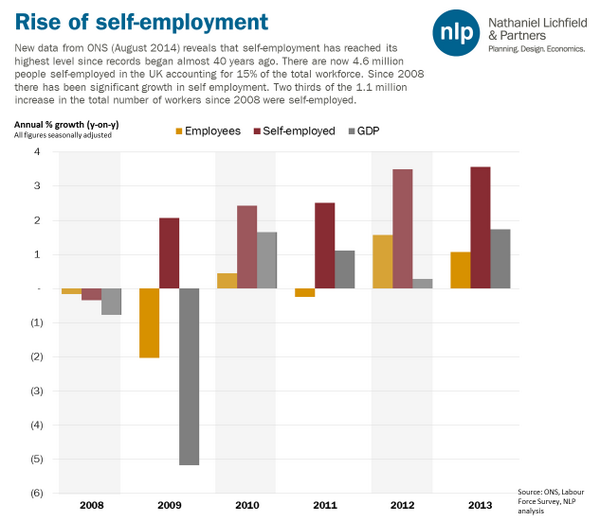 I particularly liked this chart from Nathaniel Lichfield, showing annual growth in GDP, employment and self-employment. It shows clearly how, even though employment growth fluctuated with the economy, the rise in self-employment carried on regardless. Self-employment, says the ONS, is now at a record high, both in terms of number and proportion of the workforce, accounting for around 70 percent of the increase in employment since the recession. But the increase is not due to more people becoming self-employed but to fewer people quitting self-employment. According to the ONS stats, the number of people becoming self-employed did not change much on pre-recession levels but the number of people leaving fell, by a lot. It’s like filling a bath with the plug slightly open. If you then close the plug, the bath will fill more quickly, even if you don’t turn the taps to flow faster. 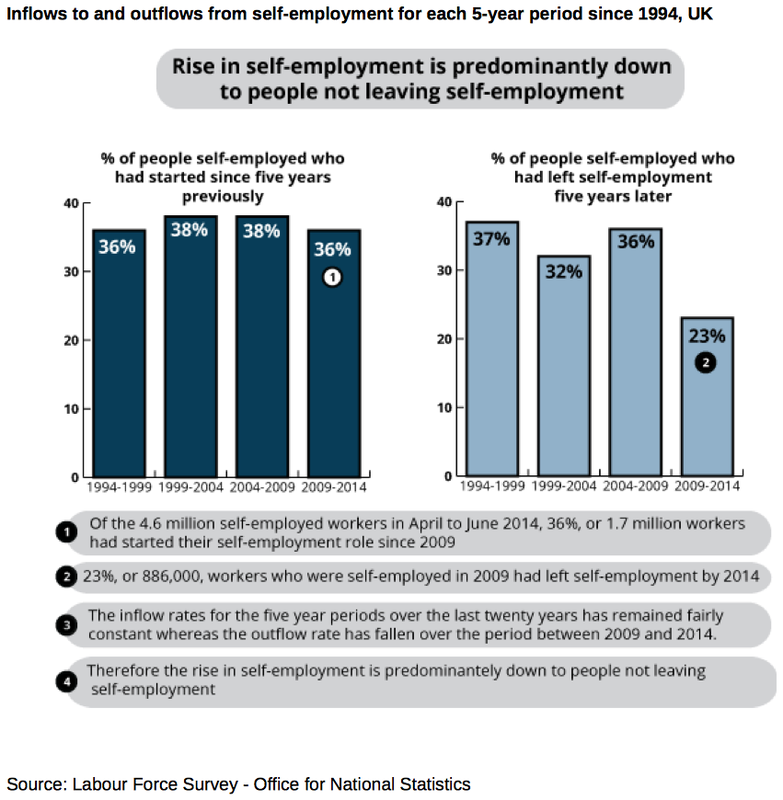 After the recession, a lot fewer people made for the exit, so, even though the numbers entering self-employment stayed roughly the same, the overall number of self-employed shot up. This puts a different slant on the story of rising self-employment. Not a surge of new entrepreneurs, hipster lifestyle businesses and redundant public servants going freelance but lots of long-term self-employed keeping on going, who might otherwise have gone back into employment or retired. It’s not particularly good for the government’s narrative. Not so much a new generation of independently minded go-getters creating their own jobs as a bunch of old lags hanging on for dear life. One or two people have taken issue with these figures. They are slightly at odds with what the Resolution Foundation said earlier this year. While acknowledging that outflows were falling, it also identified an increase in inflows. It put 28 percent of the increase in self-employment down to reduced outflow and the rest to an upsurge in the newly self-employed. Where there is no argument, though, is on the massive fall in self-employed earnings. The ONS estimates a 22 percent drop in pay since 2008. This is consistent with the Resolution Foundation’s findings and the HMRC figures I discussed earlier this year. 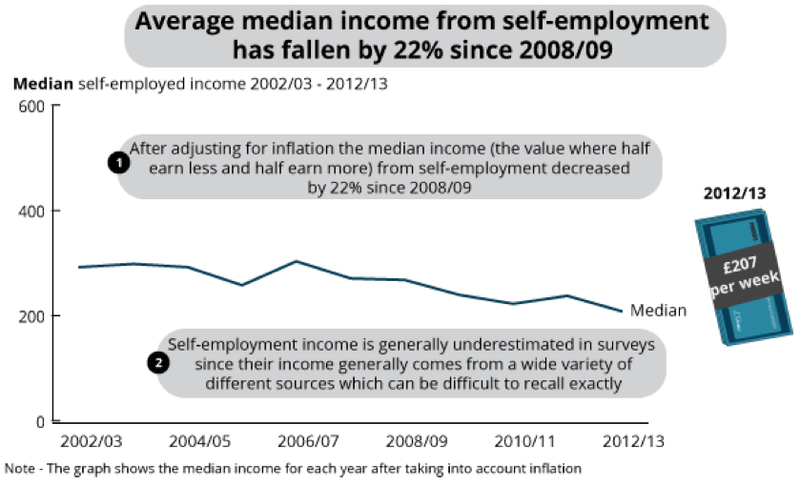 As ONS says, the self-employed may under-state their income in surveys but they have been doing this for years. Therefore, while it might understate the overall earnings figure, it wouldn’t make much difference to the percentage by which that income has fallen. That self-employed incomes have collapsed is now surely beyond doubt. Although there are hundreds of thousands more people self-employed than in 2008, £8 billion has disappeared from self-employed earnings. That’s an astonishing amount. The LFS suggests that the rise of around 100,000 in working age self-employed during 2013 was accompanied by a rise of around 40,000 in self-employed recipients of tax credits. 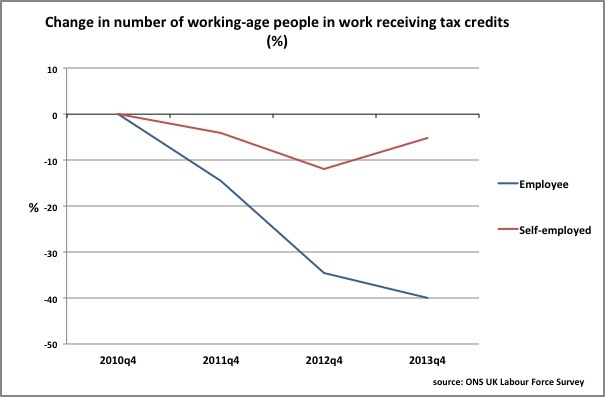 Now this doesn’t mean that 40% of the newly self-employed claimed tax credits – the increase in tax credit recipients could have occurred amongst the existing self-employed. But all other things being equal it does point to new self-employed incomes not being enough to get by on, and/or self-employed income falling to a much greater degree than for employees. Whether or not the rise in self-employment is due to new entrants or the existing self-employed hanging on, the effect on the incomes of both has been catastrophic. A decade ago two in three self-employed people were saving in a pension; today the proportion is probably under half…. the majority of [self-employed women] currently appear to have no pension savings at all. Again, this is consistent with the Resolution Foundation findings. Self-employment can lull you into a false sense of security. You have enough to get by so you don’t worry but you forget to pay for all the stuff you used to get from your employer. So you stop paying pension contributions, fail to put money aside for sickness and forget to do enough training. Every so often I run a session with my friend John Jackson, entitled So you want to be a freelance consultant? We go into a lot of this stuff. John, who has been doing this for years, calculated that, allowing for holidays, business development and training time, and to cover your sickness and pension costs, you would need a day-rate of £400-£500 for the equivalent of a £50,000 employed salary. You need to make a lot just to cover what you used to earn in your old job. The median cash earnings, then, even if they were the same for the self-employed as for employees would not deliver the same standard of living. The fact that median earnings are so much lower for the self-employed therefore reflects a much lower standard of living. This shortfall is most obvious when something goes wrong or when people retire. Which is probably why so many of the self-employed are choosing not to. 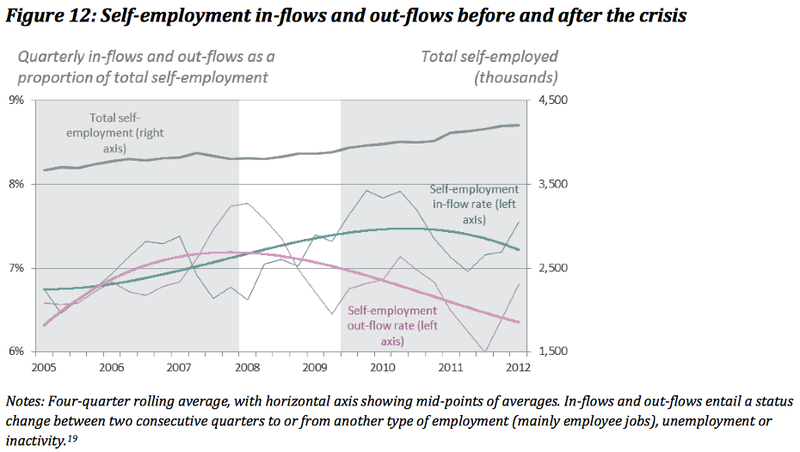 The reduced outflow hypothesis does seem to be the main reason for the rise in the number of over-65s in self-employment. The grey entrepreneur might make a good story but most of the increase is due to people who were already self-employed turning 65 since 2008. These are people who, probably for financial reasons, decided not to retire. There will be more of them as the next pensionless cohort moves through. It doesn’t take much imagination to guess what impact an army of retired, impoverished former freelancers will have on the economy, at a time when pensions will be under pressure anyway. The rise in self-employment and the disastrous fall in earnings may be storing up a lot of trouble for the future. The consequences could be with us for decades. 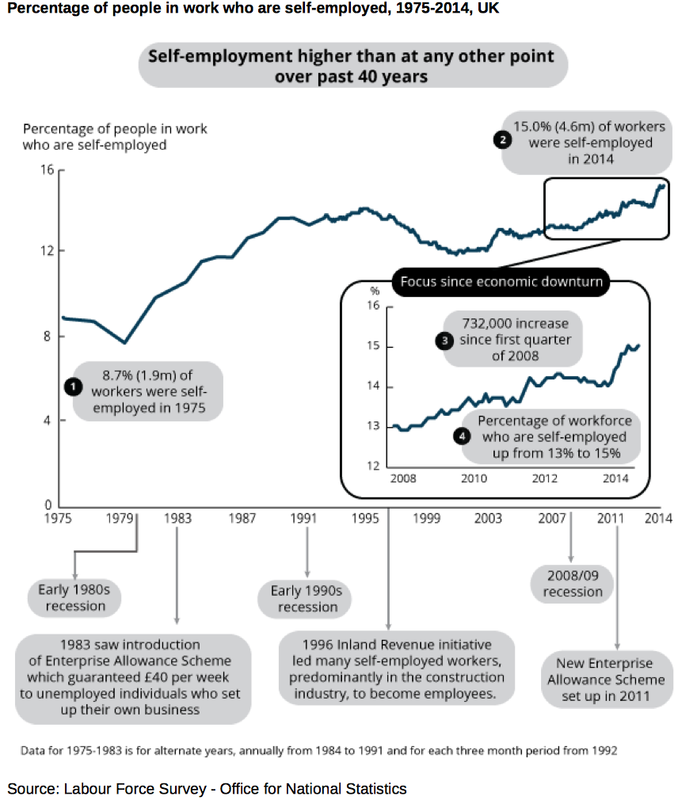 Some more good charts and analysis on the increase in self-employment. Are you better off being unemployed or self-employed and claiming the various benefits you’re entitled to as a result of low income? Many Self employed women over 50s are therefore within the working poor, suffering even more than men from tax, benefit and pension reforms, that are just more and more poverty. The low income self employed are also going to food banks to feed their children and themselves. This hunger will just increase when the infirmity of age increases, with no state pension money for life for poorest workers and a great many women. The loss of state pension payout at 60 for women from 2013 for 6 years and more, also loses a major income for women. – equalise men’s state pension at 60 in 2015. Such a party would gain far more than the 326 MPs needed to form a majority government in 2015, even adding 41 new seats in England or Wales in 2015, by bringing down Scottish Labour MPs after Scotland frees itself from Tory rule forever from 18 September. There are 21 million over 50s in the UK. 13 million in poverty. Over 15 million did not vote in 2010 general election, double the amount of any voters for all political parties. Most of those who did not vote were low paid. They could change the political landscape utterly in 2015.